As a follow-up to Chelsea’s great post on stereotypes, I would like to continue and expand on the theme by sharing an activity about stereotypes during English Week (May 21-25) in Salguiero. 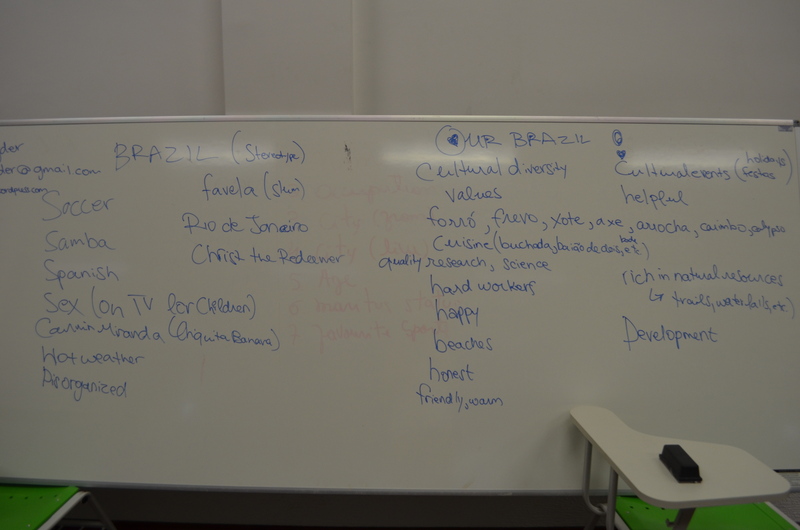 Inspired by her first American Club’s meeting about stereotypes, I decided to also touch on the theme, this time focusing on stereotypes we hold regarding the USA and Brasil. The dialogue was lively and the results were fantastic. I began the lecture with printouts of 4 provocative pictures. In groups of 3 students and staff worked together to write opinions, descriptions and questions on the back of the photo. When I said switch, they were to exchange pictures with a group who had a picture different from theirs and repeat the process. After the third switch someone from each group was called to stand up and read the comments on the back of the picture (comments written by groups other than their own). After each group spoke I revealed who the people in the picture were (see the included power point presentation… but before reading the answers, try yourself! ): 1 an American boy scout; 2 Japanese-Brazilians in São Paulo (the largest city in Brazil in the state of São Paulo); 3 Brazilians in Rio Grande do Sul (another Brazilian state); 4 Mexican-Americans celebrating 5 de mayo. Groups talked amongst themselves about stereotypes – definitions, when they are helpful vs hurtful, etc. and then we watched the first 4 minutes of a clip from an episode where the Simpsons go to Brazil, which you can watch by clicking here or by clicking on the slide in the power point presentation. They wrote down the stereotypes made evident in the clip, we talked about it as I wrote their comments on the white board (shown in the image below). Then all together we named some of the stereotypes people have of Americans including fast food, capitalist, warmonger, etc. But my favorite part was the discussion that followed when I provoked “ok, so we all know what we don’t want people to associate with Brazil, but what do you want people to think about when they think about Brasil”? I started them off with some of the things I associate with Brazil such as a thriving democracy, warmth and hospitality, athleticism, diversity and openness. They added many more including nature, gastronomy and lots of music and dancing from the North East . Student Feedback: on the left, some of the existing stereotypes and on the right, are some alternative visions as expressed by the participants!! The group present in the classroom represents mostly people from the interior of the North East region of the country. Yet Brazil is physically massive with extreme regional, cultural, environmental and even linguistic diversity. With the World Cup (2014) and the Olympics (2016) coming up, Brazil will be spending millions on selling its (whole) self, and I for one and thrilled to see what they will come up with! So, readers, what do you all think about Brazil? How about the USA? I’d love to hear from our multi-cultural readership–have Chelsea and I made you think twice about any stereotypes formerly held?